Hi Jose, very good colour and detail in the Iris, A + for the DOF. and compostion. well done..
You really very soon you can rejoice of these amazing flowers at this time.I like these flowers:interesting shapes petans and gorgeous colours.You are very nice composed this picture with very good POV and DOF.Colors and details are amazing.According to green vegetation against a background it looks, that the already you have you got spring really.Well done,TFS. una flor espectacular, me agradan mucho. bellos colores y agradable compo y textura. Y lleg� la primavera algo temprano! Hermosos los colores en esta generosa -en tama�o- foto, donde nos podemos dar gusto con todos los detalles de la flor y sus petalos. Muy buena la exposici�n, el encuadre y la bonita luz que supiste capturar. Very nice inclined composition of the shot and perfect reproduction of all beauty of this flower. Details of the petals are really great: we can see even their microscopic elements and colour tones. DOF is perfect too: whole plant is in focus. Strong sunlight is also very impressive. Perfect done and TFS. What a beautiful closeup of this Iris. The colors are magnificent as are the details. I haven't seen one since I moved to the southwest of the US. So nice to see this one. Your artistic eye and your technical expertise endow even the most ordinary subjects with special grace and charm, Jose. This beautiful Iris is in no way an ordinary object, though. What I am trying to say is that in photography, a beautiful subject does not always turn out to be beautiful per se; it requires that special artistic eye. This beautiful images is the perfect example of my contention. Resulta muy dificil obtener un color tan real como el que has conseguido. Unos detalles del diez. Realmente hermosa. It frightens me: "... a little soon according experts opinion. But temperatures are higher than usual..."
Animals, PLANTS, and HISTORY are "telling" us something. Are we going to 'listen', 'see' and use our intellect to do the right thing/s????? Jose, my friend, this is a detailed, sharp and clearly registered subject. Best of the best to you. Eu n�o conhecia esta flor...bonitas p�talas num tom forte que me agrada. Bom contraste e nitidez...parab�ns!!! Fantastic color and detail that you are presented. Great pov and composition. TFS this fine image. �Qu� espl�ndidamente has captado este iris! Los p�talos parecen de terciopelo, tienen una nitidez y una textura impresionantes. La flor resalta con toda su belleza de formas y de colorido. Excelente punto de vista, profundidad y composici�n. Lovely close up.POV,colors,clear details,3D effect and framing are excellent. Fine close capture of a species of spring Iris that I remember from my last visit to Spain in April. Our spring is early too: global warming? Thisis sharp with fine colouring and composition and contrasts well against the BG. Another lovely shot from you, my friend! The colors of this beautiful Iris are so vivid and wonderful and they stand out so beautifully from the picture. The details are also terrific and very sharp and the DOF is impeccable - blurring the BG very nicely and therefore isolating your subject very well. Nicely exposure and composed, as well. Very nice picture with very fine colors and details, well composed. Another wonderful flower from you ! You are lucky to see them grow in your fields, must be too cold for them in France because I have never seen them, except by the gardener. You managed to reproduce the details perfectly, with excellent details and beautiful colors. Beautiful composition too. very well done ! Beautiful close up of this lovely species of Iris. Excellent depth of focus and sharp details. Lovely colour and a�very nice composition. Sorry I'm alittle late. This is an real beauty , like you say. The photo is well taken, with wonderful light, without overexposition and the little shadow parts give more plasicitity to the flower.Bravo. this is very nice photo of Iris,I like the detail of it with the grey hairs. You capture some impressive details here, the macro work is very well done! Spring is in the air ... wow those colors are fabulous. Ver nice how you filled the frame with this lovely flower. The purple dominates the canvas perfectly. DOF, shaerpness and lighting is wonderful. Beautiful like all Irises. Very good nuances of violet and very good BG. Nice composition. And in Romania it is a little soon, and many species is flowering now. a striking beauty indeed. Most impressing how well you handled the depth of field necessary to show all those rich details and those fascinating hairy landing strips on that voluminous blossom in perfect focus. Thank you! Very usual Iris species for me and for my country. You will remember, I've send one in last Autumn, and I've mentioed that we cultivate it in our graveyards to decorate there. I noticed your f value for taking this shot. Best choosing to show whole flower in focus. Bravo and TFS my dear friend. And please excuse me, I've to work very hard and thus I cannot find a opportunity to visit your pages and write some critiques. 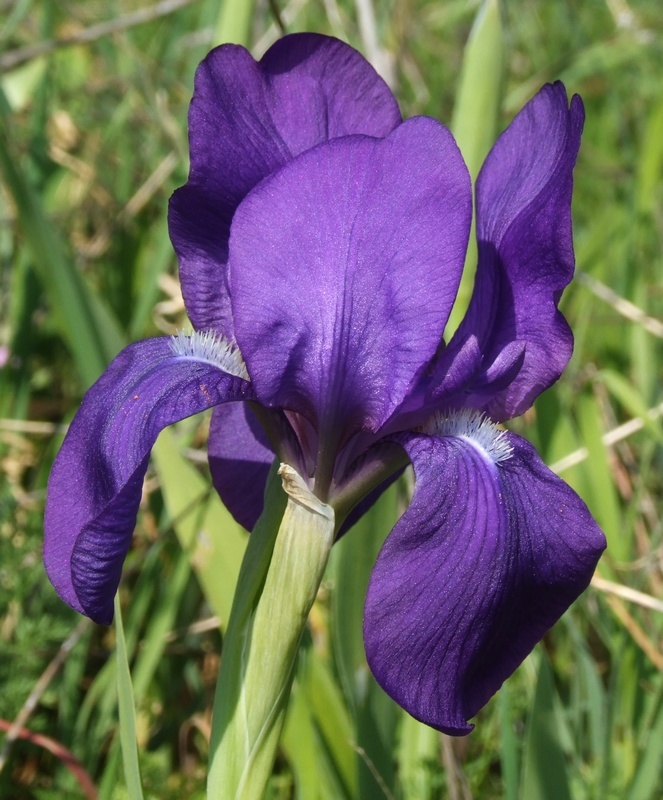 Otra magn�fica muestra de tu pasi�n y talento para retratar flores Jose, con un gran contraste de colores entre el iris y el entorno lleno de verdes. Me gusta el punto de vista que elegiste, generando una imagen clara, precisa y plagada de detalles de este bello ejemplar. El escaso y efectivo DOF elegido permite la difusi�n del segundo plano a pesar de percibir como muy cercano. Otro punto fuerte es la correcta iluminaci�n, sin reflejos ni sobre exposici�n alguna a pesar de la intensidad de la misma.